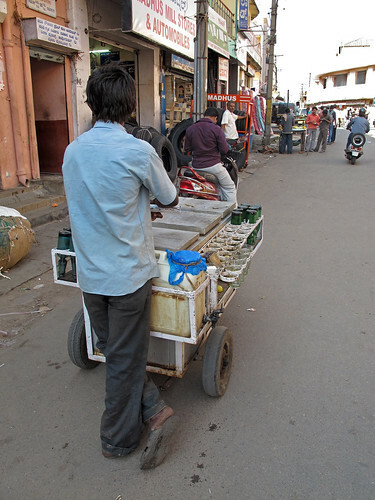 This is a poor photo of a very interesting bottle, despite the fact that the boy running this soda cart in Mysore was being super helpful. (Below, some clearer photos of this type of bottle, courtesy of Wikipedia.) This is known as the Codd-neck bottle and you can read a full history and explanation below, but in short, the bottle is sealed via the use of a glass marble held in place by the pressure of the aerated soda; pressing the marble down either with a thumb or wooden plunger releases the seal, dropping the marble into the curved cavity and allowing the soda to pour out. I remember these bottles very well from my first trip to India, back when all soda pop in the country came this way. This was before the liberalization of India’s restrictions against imports, restrictions that had been instituted after Independence in an attempt to develop and protect homegrown industries. Now with liberalization has come classic consumer capitalism, less standardization, greater waste and plastic everywhere. Remember there are nearly 1.3 billion people in India, so changes such as this have significant consequences. In 1872, British soft drink maker Hiram Codd of Camberwell, London, designed and patented a bottle designed specifically for carbonated drinks. The Codd-neck bottle was designed and manufactured to enclose a marble and a rubber washer/gasket in the neck. The bottles were filled upside down, and pressure of the gas in the bottle forced the marble against the washer, sealing in the carbonation. The bottle was pinched into a special shape, as can be seen in the photo to the left, to provide a chamber into which the marble was pushed to open the bottle. This prevented the marble from blocking the neck as the drink was poured. Soon after its introduction, the bottle became extremely popular with the soft drink and brewing industries mainly in Europe, Asia and Australasia, though some alcohol drinkers disdained the use of the bottle. One etymology of the term codswallop originates from beer sold in Codd bottles, though this is generally dismissed as a folk etymology. These bottles were intended to be returned to the factory to be used again, but no doubt many were broken by children to retrieve the colorful marble inside. With so many contours and narrow corners, this bottle seems as if it would been difficult to wash and re-use. Despite these limitations, the Codd stopper bottle and its imitators became the most widely used in England and Australia. In America most bottlers preferred the Hutchinson stopper, a rubber and wire plunger inside the bottle sealed by the pressurized liquid in a similar way. I never got sick from drinking out of these in India. 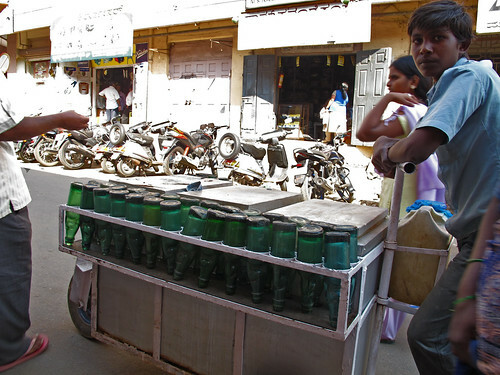 On my recent trip to India I only saw these bottles rarely, and only in old-fashioned soda carts like this one. As I said, on my first trip decades ago, these bottles were everywhere. Because the soda water was sterilized, it was a safe drink for foreigners and I must have drunk hundreds of bottles of it, while my boyfriend drank the sweeter stuff, mostly orange. There were no plastic water bottles anywhere to be seen. 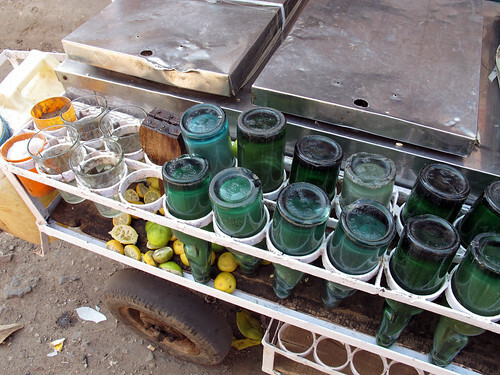 By the way, these citrus soda carts are a brilliant idea. Delicious fresh lemon or lime sodas are made by mixing the plain soda water with freshly squeezed local citrus and local cane sugar, which is far better for you than our current sweeteners in North America. (High fructose corn syrup, which is molecularly unnatural and recently linked to obesity, hasn’t been forced on India yet by the aggressive American corn industry.) Handmade lemon soda drink is far better than our soda pop here, and healthier too as long as the bottles are fully dried before refilling. Lastly it’s far better for the environment than anything we’re doing now. Plastic! Re-melting aluminum! Melting down glass! Argh. You can see from the photo the sheer variation in colour of the bottles, suggesting many, many iterations. Also the fact that many of them are very chipped on the bottom. They have all been reused many, many times. 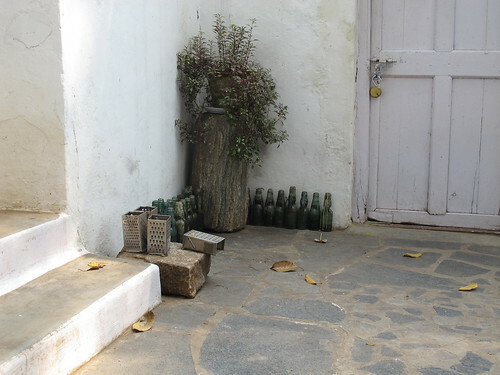 Below, a friend in Mysore has collected quite a few Indian Codd-neck bottles. It’s too bad they’ve become an object of nostalgia rather than a permanent fixture in soda consumption. I have one of these myself, thanks to my sister’s genius for Christmas presents, but it’s an American not an Indian antique. This entry was posted on Tuesday, February 21st, 2012 at 2:48 am	and is filed under craft, design, green. You can follow any responses to this entry through the RSS 2.0 feed. You can leave a response, or trackback from your own site. This post makes me a little sad, but at the same time it’s beautiful. I love these bottles, and I knew nothing about their existence before this post. Hope all is well! Thanks Janis. I know, sorry. I was so sad to see the decline of these things – it was such a genius method of dispensing pop. The bottles were beautiful and it was fun to open them. Now they have coca cola in India, which is not an improvement, and this artisanal lemon soda seems low budget (a bit of a reversal from the situation here). My first trip to India was a very long time ago. We were there in the hottest season and were constantly dehydrated. I have no idea how many pure club sodas we drank from these bottles but as I said it was in the hundreds, and we never got sick. Hope you’re well too! The lychee soda is awesome, and I think you can find the marble bottle from a few brands/flavors. I agree- the bottle is fantastic! Hi John – yes, I’ve seen those! Aren’t they great? It’s just they all seem like a novelty these days, and I don’t think anyone refills them anymore. I’ve had Ramune, the Japanese soda, in a local chain of restaurants here in Vancouver called Guu. I guess I’m more lamenting the loss in India of a huge, well-organized system of reuse. Have you found any of these antique bottles in your travels? Yes, it does seem like the north american way is taking over the world. More plastic for everyone! If I find any in my antique hunting, I’ll let you know! I wish I could reuse them with our Sodastream! Or really any old bottle for that matter. It is sad how they’re relegated to novelties as plastic takes over. I remember a few years ago going to a Mexican grocery to buy sodas, and how all the bottles had such great wear and patina from all the reuse. Like the middles of Coke bottle were worn to frosted white. Unfortunately aesthetics and consciousness doesn’t fly with the majority of Coke drinkers. John, I remember coke bottles looking like that when I was a kid! We did have refilling once… this whole plastic thing has passed its due date. My memories of the Ramune soda bottles date back about 28 years ago. Back then they were hard to find and hard to get in the US (made them a real treat). Quite often the bottles would show wear and tear, then when i visited Japan I found out the bottles would be returned for refilling. I remember buying a bottle from a vendor at a temple and you were expected to return the bottle to him when you were done. Flash forward to the present and now Ramune is easily found around here and the bottles are redesigned to reflect the fact they aren’t going back to be refilled, but disposed or recycled. BTW I also loved the the single serving glass milk bottles in Japan, also returned and refilled. I used to have some of the old bottles somewhere, now I feel like finding them to show my kid. Oh and another thing the old Ramune bottles took skill to drink out of. You had to get the marble balanced just right, so drinking with friends or siblings always became a game of skill. Also visual trivia for anime fans, did anybody spot the bottle under the house in the movie My Neighbor Totoro? @ Dean Yes! I saw that bottle in Totoro! I’d forgotten about that when I wrote this post! I also remember when those bottles were refilled in Japan – it was evident because of the telltale milkiness and roughness of the glass from being bumped and washed over the years. It felt nice knowing the bottle wasn’t going to be melted down after a single use. And you’re right – I remember from my first trip to India that you had to drink from the bottle by holding it at a certain angle – though I think the ones in India are easier to drink from than the Ramune one. Thanks for reminding me of all that. BTW the sad thing is I also remember back when you would return bottles for deposit at the grocery store to be refilled. This was back in the 70’s and I have fond memories of my Great Aunt in Monterey CA. giving me 7up in the classic 7 ounce glass bottle. And we had milk delivery in gallon glass bottles. The sad thing is I’ve noticed that part of the problem, at least for here in Southern CA is that a lot of the really local farms and dairies have been pushed out for the land. Where I live now used to be dairy farms in the 60s. There used to be farm fields 10 min away where strawberrys and vegetables were grown, now it’s covered by corp businesses. And there is only one dairy selling milk in glass bottles (half gallon). It’s pricey, probably because of the need to pay for the return of the bottles. Urban spread and central distribution. Oh well, enjoying your site, thanks. 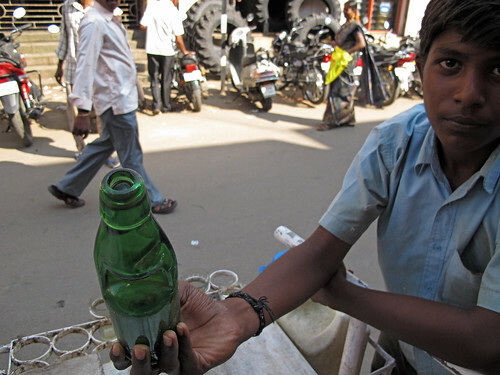 Excellent post, good to see that Hiram Codd’s bottle is still going strong, most likely a good Idea to get some of these Indian bottles while you can, as Codd bottles are highly collectable, early bottles dating from 1870’s can be several hundred pounds sterling, any in dark blue glass are worth thousands. Thank You for sharing this remarkable information with everyone..
Love the Codd bottles. They are collector items here in Bermuda. In the 1800’s into the 1920’s, these bottles were made in England (who, I believe, sold their machines to India) for businesses in Bermuda, having their names and Bermuda embossed on them. Some even had dates also embossed. 1899, 1900, 1901, 1902. In the 1990’s I spent many, many beautiful hours scuba diving off shore for these wonderful bottles. And yes, many of those found were broken with the marble missing. Found about two hundred unbroken bottles in different conditions; as you can imagine, having been thrown overboard by picnickers and travelers over bridges, some fell among coral and were battered by the motion of the shallow depths of the sea. Those that were found burried under our white and pink sands were in beautiful condition. Happy times….